There was so much nonsense in Brownback's State of the State Address that it took me several days to really consider it. My immediate thoughts about the speech went something like this: Brownback has lost his mind. 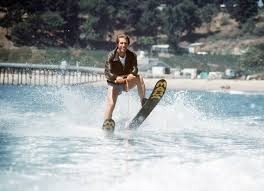 He's jumped the shark. He's taken complete leave of his senses. I waited to post, because I want to give our governor the benefit of the doubt. He may still have some of his marbles, but he's definitely jumped the shark. Brownback's proposals are tired retreads. Most baffling is the Governor's insistence that we MUST HAVE ALL DAY KINDERGARTEN. Not only that, but it should be funded by the state. For the life of me, I can't figure out why we need this when all of the research on the topic suggests whatever small advantages kids garner from all-day kindergarten evaporates by the end of first grade. So I guess, we're shooting for higher grades the first semester of first grade? I'm not really willing to pay thousands of dollars for that outcome. If it were my money, I would weight the benefits with the cost and see that it's not worth it. But it's an election year. And apparently half of Kansas is convinced that the condition of most Kansas schools is roughly equivalent to those of concentration camps. So conservatives think the solution to this (non-problem) is more money, more money, more money. Oh, and more teachers. And more teachers in teacher's unions. Problem solved! The other arguments I've heard for the state-funded, all-day kindergarten go something like this: The sooner kids go to school, the sooner we can intervene (with their problems. They're too poor. They have special needs. They have <<insert challenge that only state funding can solve>>). My problem with this is a very philosophical belief about government intervention into the lives of citizens. I don't like it, period. I can understand and appreciate that earlier autism interventions, for example, mean better outcomes for children with autism. But funding all-day kindergarten with that as a purpose seems like dropping an ocean-size net in the hopes of catching a few minnows. The second most common argument goes something like this: Day care is expensive. Kindergarten is better than daycare. State funded, all-day K helps parents. Um. Since when did it become the goal of state government to make sure life is a bowl of cherries for parents? Government shouldn't do anything to make parents' jobs more difficult, but I'm not sure why those without children or with grown children should have to work so parents can put their kids into state-funded day care. And if that's really a problem we want to solve, why not just call the Brownback proposal "All-Day State-Funded Daycare?" At least you don't have to have a teaching license to run a daycare. Kansas could put kids in state-funded daycare for about a quarter of the cost of all-day kindergarten. A bulk of Brownback's speech was dedicated to education, and a large part of that involves his plans to take money out of my wallet to line the pockets of teacher unions. No thanks. Also, whoever wrote this line, "It seems strange to me that the state counts all of the 12 and only half of the K." That's Brownback, in the speech. Dear speechwriter, take a lap. I think the phrase was meant to be catchy or witty or quotable. It wasn't. It's yucky and ridiculous. Don't use it again. Like his kindergarten proposal, the majority of Brownback's proposals involve spending more money. The Governor also proposed $2 million in new spending to address housing shortages in rural Kansas. I don't get it. If there are housing shortages, aren't there developers interested in solving that problem and making money on the solution? This just seems like the job of entrepreneurs. When government fills a gap, it crowds out opportunity for businesses and individuals. In addition to his proposals, the Governor used part of his time to spout complete and total nonsense. The speech was filled with head-shaking non-sequiters. For example, in the middle of the speech Brownback introduced two wounded war veterans from Ft. Riley. Now, I love our soldiers probably as much or more than anyone, but the introductions were for show. "Please welcome Capt. Adam Cowan and Capt. Casey Wolfe. In Kansas we honor our veterans. We remember their service with gratitude and are humbled by their commitment to this great nation," Brownback said. And before and after that he talked about stuff that has zero to do with the military or soldiers. Introducing soldiers was pure political theater. I would like to think Republicans are better than that -- attempting to score points that way. I mean, introduce them as your special guests at the beginning of the speech if that's the case. But why, in the middle of the other nonsense, make a show of pointing them out? It was theater and nothing more. Not cool. And then there's the stuff about traveling to Mound City to meet with descendants of the survivors of the Pottawatomie Trail of Death. Brownback said he went to a graveyard where American Indians were buried, and he apologized "for the barbarous treatment of Native Americans moved to Kansas." But he wasn't finished with apologizing on behalf of everyone in the state. Brownback also offered his apologies for segregated schools. Or Brown vs. Topeka Board of Education.What on earth. "As Govenor, I acknowledge and accept responsibility on behalf of the people of Kansas and I ask forgiveness for these wrongs we have done," he said. Seriously. What in the world? Who is he apologizing to? Was he an active participant to any of those things? I sure wasn't, and you'll note, I'm not running around apologizing for things I didn't do and had nothing to do with. That is the garbage self-righteous liberals use to score political points. It's about as vomitous as it gets. Why would any self-respecting Republican copy this page from the liberal handbook? It's insulting. There you have it. Brownback gave a speech. It was shockingly and embarrassingly awful. So I'll offer apologies on Kansas' behalf. I am sorry for that icky display of politics. I did have something to do with Brownback's election. I worked on his campaign. I voted for him, and I talked many of my friends and neighbors into doing the same. Take my apology with a grain of salt, though. There's a better than even chance that I'll be voting for Brownback again. I've got limited choices.